His eminence the importance of enacting important laws and carry out follow-ups by the Reform and Reconstruction Bloc to serve the Iraqi interest. 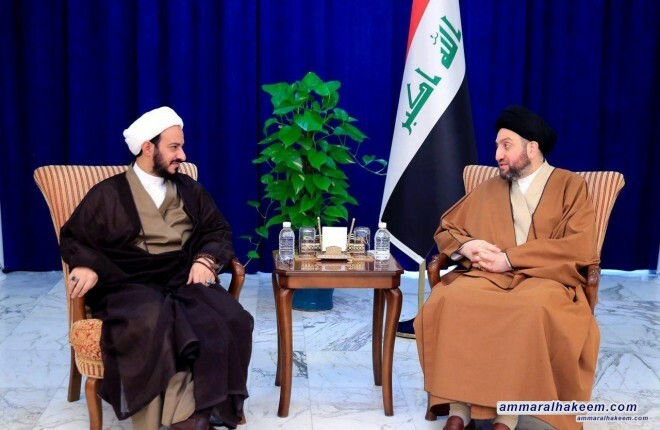 His eminence urged to work on restoring trust to the Iraqi Council of Representatives and cooperation among the executive and legislative authorities, and stressed the importance of completing the government cabinet and assigning ministers characterized of being competent, honest and with high management capacity. His eminence also stressed the importance of communication with the remaining political blocs and preservation of the Iraqi national project, with emphasis on moving forward in institutionalizing the Reform and Reconstruction Alliance and complete all the requirements for this task. His eminence congratulated Shaikh Sa'idi for being elected as head of the parliamentary bloc of Reform and Reconstruction Alliance.